This fast cruising motor yacht accommodates up to 13 passengers, has a three stateroom layout and a stunning fly-bridge. The bright woodwork and the added audio/video options makes the 55′ Azimut yacht a perfect choice for cruising and entertaining. The 55′ Azimut Yacht's layout has three staterooms. The VIP fore cabin with its scissor-transforming berth from double to a nice twin for two adults, making this cabin a family or guests' affair. 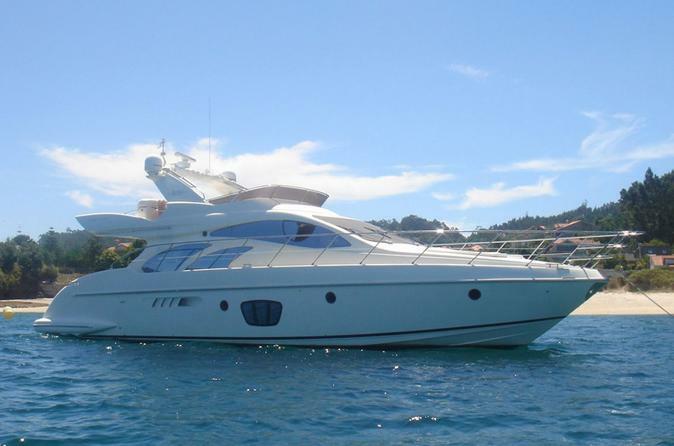 The 55′ Azimut is a perfect choice for your yacht charter in Miami, a perfect choice for cruising and entertaining. Your yacht rental adventure includes tours of Biscayne Bay and the surrounding Miami area. See places such as the picturesque skyscrapers and mega yachts along the Miami River; tour the luxurious mansions of Millionaire's Row: Star Island, Palm Island, Hibiscus Island, Dilido Island, San Marco Island and the Venetian Islands; stop for a Beach Picnic at Flagler Memorial Island; cruise alongside the Miami Skyline, or race along the port "Miami Vice" style. You can also anchor for a Boat Party at the Wildly Popular Nixon Sand Bar or dock at Bayside, The Epic, American Social, Salt n' Pepper, The Standard or Rusty Pelican.